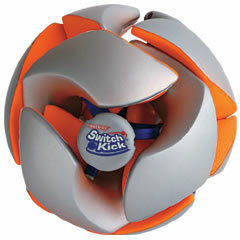 The Switch kick is a transforming sports ball that magically flips colors when kicked or thrown. The strong, sturdy and safe ball is made of urethane. When the ball is thrown or kicked it changes color- the foam covered panels flip “inside out” to reveal another color. When the ball is thrown its size becomes 1.5 times big and when you catch you have the sports ball with a different color. There are endless ways to play with the ball. The Switch kick weighs 32.g and is available for approximately for 3,990 Yen ($34). Use Switch Kick to add a whole new dimension of play to the sports and games you already love, or invent completely new games!